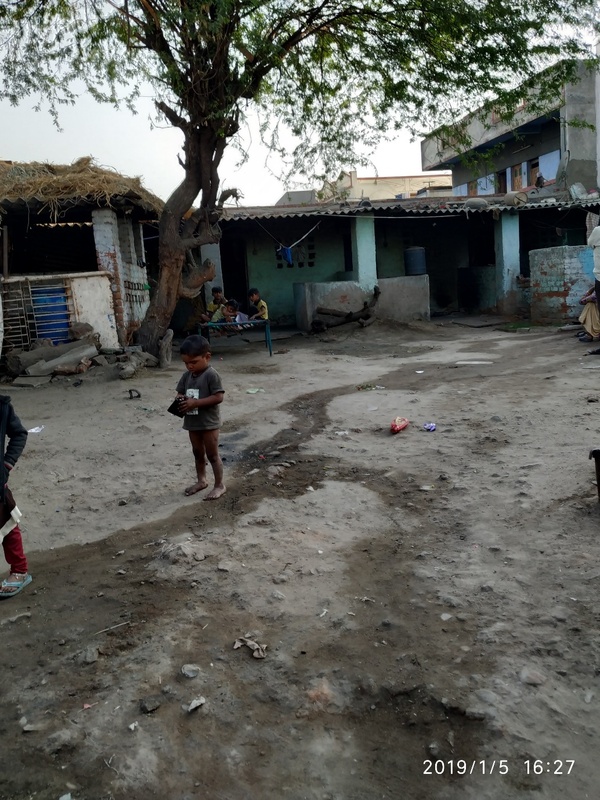 Machunagar is a slum in Gujarat where migrant workers of the Vatva GIDC reside in squalor. The state has the highest gap between minimum wages paid in the state and wages decided by NREGA. Suman Kesar Vaniya was 21-year-old when she accompanied her husband to Gujarat from Prayagraj district, Uttar Pradesh. Like many from her village, Ashok Kumar, her husband had migrated to Gujarat in search of a job. Suman, newly married then, had dreamt of a better life and hoped that one day they would earn enough to return back home. 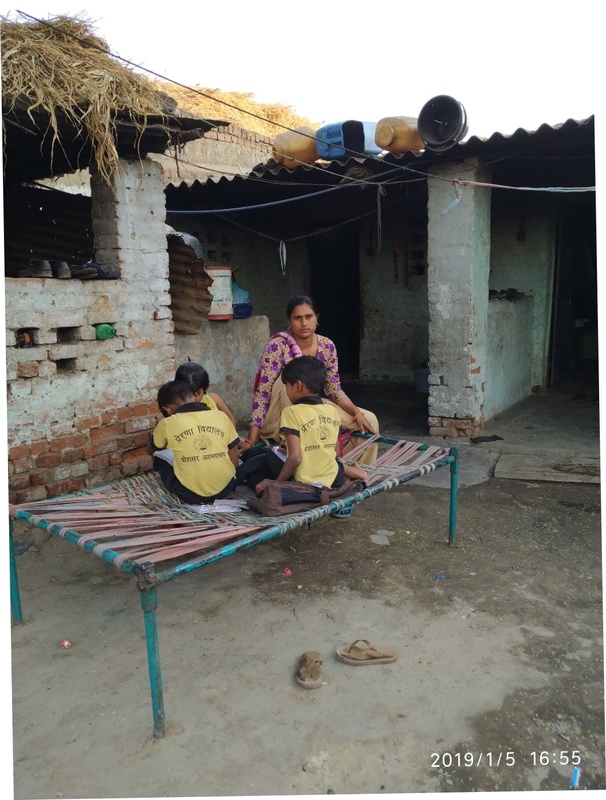 Suman and Ashok are a family of five now, living in the squalor of one room house at Machunagar area of Vatva GIDC (Gujarat Industrial Development Corporation) Ahmedabad. In 20 years, the family has been able to visit their home in Uttar Pradesh just two times. 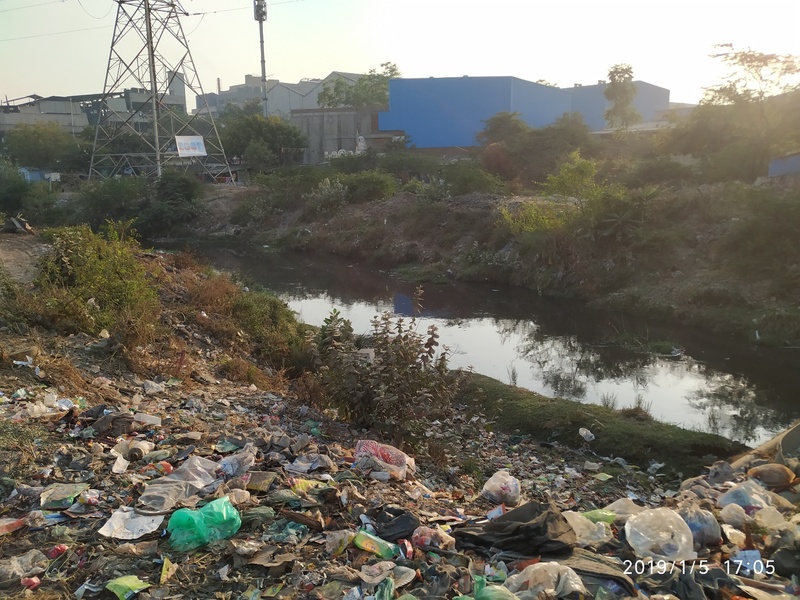 Machunagar, an area where workers of the industrial area in Vatva reside is a large slum. Most of who reside here are migrated workers from Uttar Pradesh, Madhya Pradesh and Bihar with a handful of workers from rural Gujarat. “When I had left home in 1998, we had first arrived in Surat. We lived there for three years and then migrated to Ahmedabad in search of better job but life has not got better in 20 years,” Ashok Kesar Vaniya told Newsclick. “We are a family of five now and it costs an average of Rs. 8,000 to Rs. 10,000 to make one trip to home and back. Whatever we earn gets spent, it is very difficult to save that kind of money from the meagre amount we earn,” told Suman. After trying his hand as a labourer for years, Ashok has managed to open a small provision store just outside the slum he and his family reside in Vatva industrial area of Ahmedabad. “Over the years we have faced many hardships but the worst thing that has happened is that my eldest son had to start working as a labourer from the age of 14 because of financial crisis,” shared Suman. “He had to drop out of school as my husband’s income was not enough. An industrial worker earns Rs. 250 to Rs. 300 a day on an average. To add to that, there is no guarantee that one will have a job 30 days a month. At times, a man goes without any job for fifteen or twenty days a month,” she added. Suman’s son is now 21 and works as a labourer in the loading department of a factory. A 12-hour shift fetches him Rs. 300 a day. 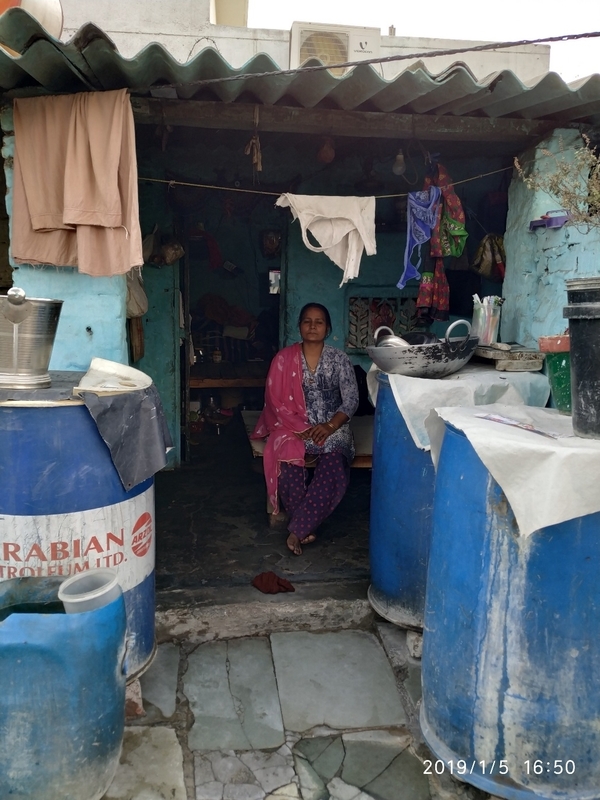 Residing in Machunagar, Suman’s neighbour is Kiran Devi who has been here for three years. Like Suman she too pays Rs. 2,000 as house rent for one room that has no water facility. Every room has a small adjoining area fenced by a three-foot brick wall enough for only one person to stand, that the families have for bathroom. There are no toilets; for defecating, there is an open drain about 100 metres from their house that both men and women use. The drain in Vatva GIDC that is the spot for open defecation for workers and their family. Most houses don’t have toilets. My husband works in a factory that manufactures paint. He leaves at 8 in the morning and comes back home at 8 or 9 in the night. But there is no guarantee of being employed 30 days a month. When there is no work at the paint factory, he works as a labourer in whatever work he can get. Despite working for 12 hours, he is never able to earn more than Rs. 10,000 a month.,” shared 31-year-old Kiran from Bhind district of Madhya Pradesh. Kiran with her children. Her husband is an industrial worker. His income is barely sufficient but she wants a better future for her kids. “How do I run a family with Rs. 10,000? I have three kids, they are all studying. Even though we barely scrap through the cost of basics, I want to be able to bear their school fees at least,” she added. “Jo bhi ho, unka zindagi humare jaisa nahi ho (No matter what their lives shouldn’t be like ours),” Kiran said. Noticeably, the figures released by the NREGA (National Rural Employment Guarantee Act) Sangharsh Morcha, a civil rights organisation working towards the implementation of the scheme, stated that Gujarat has the highest gap between minimum wages paid in the state and wages decided by NREGA. While NREGA has stipulated the minimum wage to be Rs. 298 per day for Gujarat, the average minimum wage paid to the labourers in Gujarat is Rs. 192 a day. To add to the workers’ woes, the Gujarat government reduced the minimum wages of industrial workers in October 2018 after a hue and cry on rising prices of industrial commodity. Workers of brick kiln, ship breaking, garment sector, sweepers and sanitary workers are among many others whose income have been slashed due to the decision. However, while reducing the minimum wage of workers, the Labour department in its notification, requested the industrial units to continue to pay the old amount. “I have been working since I was 15 years of age. Back then I used to earn Rs. 100 a day, now I earn Rs. 300 to 350 a day,” said 40 year-old Hariram Rajbhar, a resident of Odhav area of Ahmedabad. Hariram Rajbhar was a student of class 8 when poverty pushed him to drop out of school and migrate from Mhow district, Uttar Pradesh to Gujarat. “But there are no benefits. They will never give us a permanent job or any form of health or risk insurance. If we are injured during work, the factory owner refuses to pay for our treatment even. He will flatly say he has no money if we ask,” he added. “Our family has about three bigha of land but agriculture was not profitable, so I came searching for alternate sources of earning. I work as a driver and as a labourer and earn about Rs .250 a day. But that isn’t enough to run a family. So many a times, I go home to bring food grains from what grows in our field,” said Dineshbhai Ramabhai, a resident of Dahod district, Gujarat, who came to Ahmedabad for a better prospect after his family was hit by agrarian crisis.